On Thursday, July 16th, Coal Country Chamber of Commerce officers and members presented to Dr. Shawna Heddinghaus of Fireside Eye Care a congratulatory plaque during her 10th Anniversary Celebration at 600 S. Eighth Street in Benld. 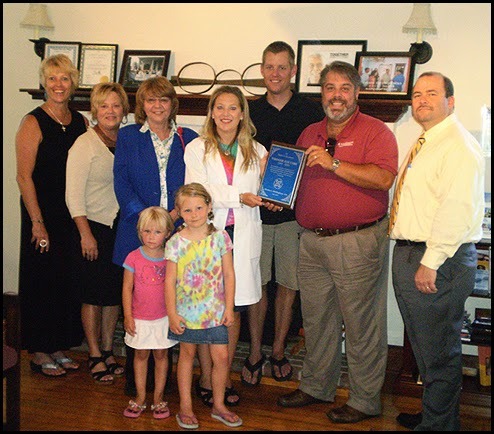 The plaque congratulated Shawna Heddinghaus, O.D., and Fireside Eye Care on 10 years in business from 1999-2009 in recognition of their commitment to the citizens and communities of Benld/Gillespie and surrounding areas. In the picture from left to right are: Jean Strausburg, Administrator of Heritage Manor of Gillespie; Micki Chappelear, Community Relations of Heritage Manor of Gillespie; Denise Buske, Buske AAA Insurance Independent Agent of Benld; Ella (4 years old) and Lily (6 years old), children of Shawna Heddinghaus, O.D. and Toby Heddinghaus, Owners; Greg Craine, 1st BancFinancial/FNB, Benld Banking Center and Vice President of CCCC; Mark A. Smith, MetLife Agency of Benld.